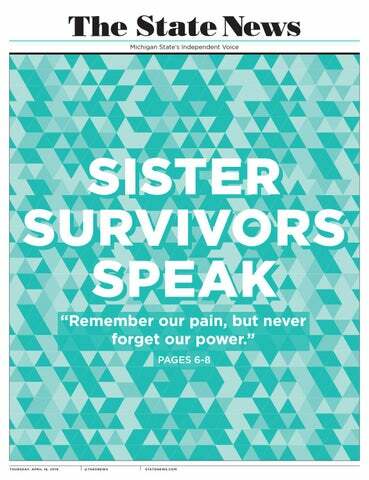 The Michigan State Museum’s "Finding our Voices: Sister Survivors Speak" series will be holding its second panel discussion on Feb. 12. "(The discussion) will be on consent and what that means to each person in their capacity," Louise Harder, a strategist with The Army of Survivors, said. "I will be speaking to affirmative consent and what that could mean." For instance, affirmative consent is not just 'no means no,' Harder said. "It's asking for that affirmative consent so I think that's an important conversation to have with people and change some of these cultural ideas that we have," she said. Harder said MSU Museum Director Mark Auslander worked closely with a number of survivors to choose which topics, like understanding consent, would be discussed during the speaker series. "They were working together to come up with some topics that they thought would be ... really good to talk about, needed conversations," Harder said. Nassar survivor Danielle Moore, also a member of The Army of Survivors, will be speaking alongside Harder. "I'm interested to hear her point on things," Harder said. "I'm also interested to hear other pieces of it and what messages on consent we're going to get." This speaker series acts as a lead-up to the April 16 opening of the MSU Museum’s exhibit "Finding our Voices: Sister Survivors Speak." Future dates for the speaker series can be found here.